On this September 21st, Vietnam Tourism Association had cooperated with Ho Chi Minh City Tourism Association to launch Vietnam Culinary Conservation, Research & Development Center (CRDC). CRDC was established on November 24th 2016, located at 18 Truong Dinh str., ward 6, district 3, HCMC. 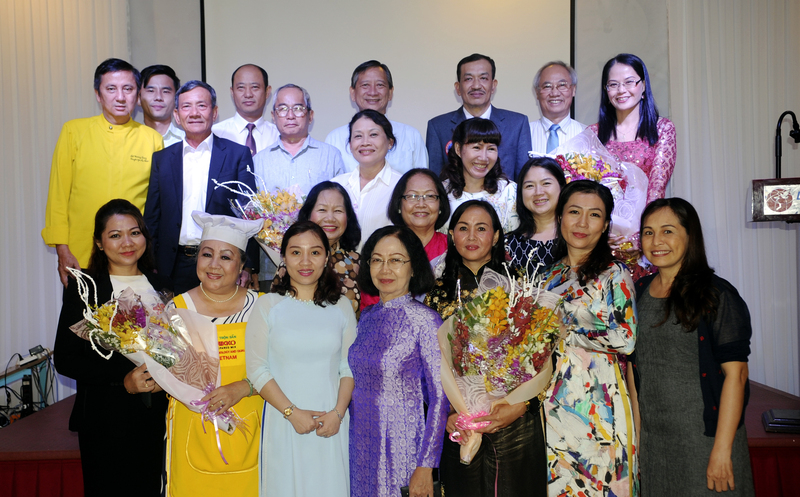 It has one Advisory Council of Cuisines and four specialized boards (including Researching and Collecting Vietnamese Food, the Studying Vietnamese Food Nutrition, Developing Vietnamese Cuisine, and Communication and Public Relationships Department). The center operates under the management of the Ho Chi Minh City Tourism Association, authorized by the Vietnam Tourism Association. CRDC has been playing its roles as an object that studies, collects, introduces, and promotes Vietnamese cuisine as well as collaborates with other firms/groups to train fine chefs of hotels and restaurants in order to support domestic tourism. Therefore, CRDC is also a place where food artisans, food experts, nutritional experts and instructors, professional chefs, (like food expert Chiem Thanh Long, food artisan Bui Thi Suong, artisan Nguyen Thi Nga, super chef Do Quang Long, and more), and ethical firms gather to develop traditional yet modern Vietnamese cuisine. Mr. Vu The Binh - Vice Chairman of Vietnam Tourism Association - spoke at the CRDC launching ceremony that CRDC was the very first model of organization model to research, to conserve and to develop culinary culture in Vietnam. For years, Viet Nam has been known as a country with abundant and diverse cuisine since it was a crossed place of Chinese and Indian culinary cultures. Moreover, Viet Nam has total 54 ethnic minorities that live together all over the country so different and diverse cultures are also an element enriching the whole culinary culture. Therefore, CRDC can really conserve and promote the most valuable features of Vietnamese cuisine. Recently, the main task of CRDC is to build and to hold specialized thematic studies of some featured dishes and drinks in order to introduce and promote Vietnamese tourism. More specific, CRDC will research, collect, and study nutrition facts of such dishes, with the standards of deliciousness and healthiness, to standardize chosen dishes in national events as well as introduce them to domestic and foreign diners. At the same time, CRDC will do wide surveys and compentition of catalogs to collect full data of national dishes and drinks, in which the priorities are to collect, to recover, and to develop lost culture values, including dishes and drinks of the ethnic minorities, folk festivals, and traditional villages. CRDC has revealed some of their recent studies, such as researching vegetarian food of southern Viet Nam, increasing true values of natural sweets (sugared coconut and banana soft candies in Ben Tre province), increasing value of fresh ginger in Dong Nai province, and skimming hidden condiments in Ha Giang province. In the middle of this August, CRDC also attended Street Food festival in Singapore and the Fresh Rice Noodles with Grilled Pork won the Golden prize. 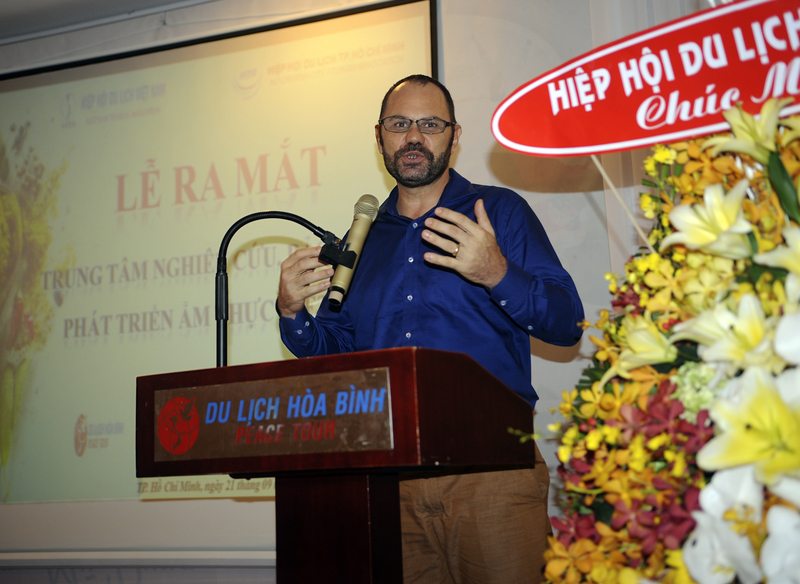 In CRDC launching ceremony, Mr. Patrick Gaveau – The Golden Spoon Project Manager – spoke, “The Vietnam Culinary Conservation, Research & Development Center is a woderful idea. You focus on food research, traditional gastronomy and food festivals. You also care to develop HR for food industry. With our passion for Vietnamese cuisine, skills and knowledge of CRDC members, support of governmental agencies, the population and the press, Monh Long is an ambassadors of Vietnam best knows how, not only with great ceramics, while promoting Vietnamese cuisine with Golden Spoon Awards (GSA). GSA began 2013, united 1.200 Vietnamese chefs, discover 2.500 Vietnam recipes rare spices and herbs. Some are remarkably published in The Quintessence of Vietnamese Cuisine. To promote Vietnamese cuisine, we began to send these books to renowned Michelin-star chefs, including Eckart Witzigmann – Chef of The Century, Sebastien Lefort – the leader of the Sunrise Academy in Singapore that it is one of Asia’s leading culinary schools, and the feedback we received has been good. * On July 4th 2017, within the International Tourism Fair Hanoi 2017, Vietnam Tourism Association also celebrated the grand opening of CRDC in Ha Noi.